Completely free to play and accessible through your preferred web browser, Thundercall is a fantasy themed RPG adventure where players take on the mantle of a hero of the land, tasked with rescuing Goddesses and defeating the rising demon army, they will travel around the world completing quests. With rich graphics and an impressive music score the game is atmospheric and immersive and ideal for all types of players. In Thundercall players will primarily be focusing on building up their hero character through a series of unlocked features including instanced quest zones where they must defeat enemies and bosses to earn XP, upgrading gear and other equipment, and various other means. With every upgrade and enhancement the players own Battle Rating (BR) is increased, a numerical indicator of their strength in comparison to other players. Many of the systems and game features are geared towards increasing BR in some way, with this players will also be able to take on more challenging events and encounters such as World Bosses or compete in the PVP Arena. Progression is very structured with new elements unlocked at different levels meaning players always have something new to work towards. There are only two classes available in the game, both of which are gender locked to a specific character, either a female Mage or a male Warrior. Both classes play completely differently in battle, with the Warrior having more survivability and a lower difficulty rating; whilst harder to play the Mage may be lacking defensively but offensively she can be an absolute powerhouse in combat. Combat is different to many RPGs of this style and instead focuses more on action skill based attacks with player’s spells and abilities being in full control of the player. Using the mouse clicks to move around they can aim their attacks at the mouse cursor as opposed to any tab targeting, giving a much higher skill curve to combat and making it much more challenging. There are multiple events that players can participate in, everything from PVE to PVP. For PVE players can face off against the Tartarus, huge Boss mobs that can be challenged up to five times a day and will grant upgrade materials for the player if defeated. 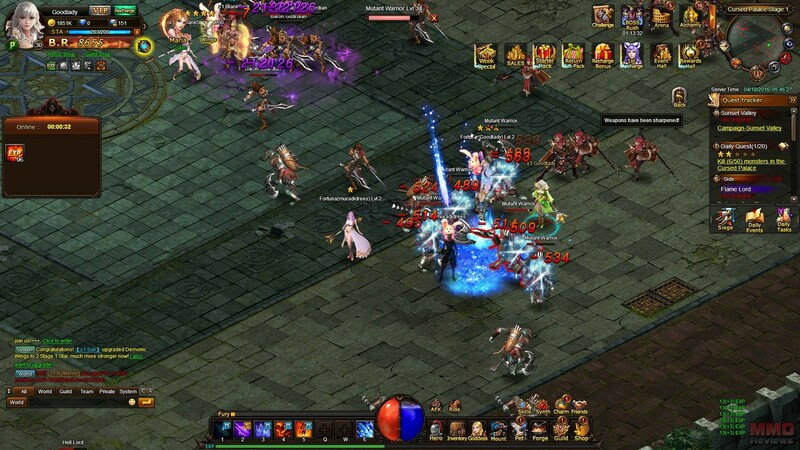 Players can fight through various dungeons on their own or take on the Team Dungeons with other players for a more social experience and chance to overcome greater challenges. In the Arena players can PVP with each other in 1 v 1 battles, by checking out the leaderboard players can challenge each other and if they are successful they will take the players higher rank, earning rewards every day for having a high rank. There are numerous ways that players can upgrade, first and foremost by levelling up their character by earning XP will increase the character’s stats, players can also improve their character by upgrading their skills to make them more powerful. Gear has a few types of upgrades, including a boost of the stats or upgrading the quality of the weapon, both of which use unique materials dropped in the different features. It isn’t only weapons that can be upgraded, both Mounts and Pets also play a key role to increasing a character BR, by hatching a new pet players can spend materials and currency to upgrade their companions, similarly Mounts can be upgraded to boost stats as well as being ridden around in game.